Keizer Homegrown Theatre will present what Shakespeare scholars believe to be the last play he ever wrote on July 26-28 at Keizer Rotary Amphitheater at Keizer Rapids Park. “Prospero’s monologue right at the end of the show is considered his (Shakespeare’s) farewell to the theatre,” said Linda Baker, director of The Tempest. The free show begins at 7 p.m.
Set on a remote island, The Tempest tells the story of Prospero, a sorcerer and the rightful Duke of Milan who plots to restore his daughter Miranda to her rightful place using illusion and skillful manipulation. He conjures up a storm, the tempest, to cause his brother Antonio and the complicit Queen Alonsa of Naples to believe they are shipwrecked and marooned on the island, where Prospero’s schemes bring about the revelation of Antonio’s lowly nature, the redemption of the duke and the marriage of Miranda to Alonso’s son, Ferdinand. The play is also easier to understand than some of Shakespeare’s other shows. Todd Logan, a veteran of Pentacle Theatre in Salem, is making his Keizer Homegrown Theatre debut as Prospero. Logan’s son Spence, who played Romeo for Keizer Homegrown last summer, is one of two actors, along with Allison Reid, cast as Ariel, spirits who serve Prospero. Kyra Wood, of Aumsville, plays Prospero’s daughter, who has only known life on the island. Antonio is played by Roy Esquivel and Alonsa, Queen of Naples, by Shannon Remple. Her son, Ferdinand, is portrayed by James Schmidt. Richard Leppig as Gonzolo, Shilah Kahree as Trinculo, Braden Pippert as Stefano, Lyndon Zaitz as lords Francisco and Adrian, Jordan Reid as Boatswain and Tim Reid as Ships Master. Sydney Colman, Megan Cox, Chantelle Gemmill,Becky Nielson, Rebekah Pippert and Lauren Stenson play druids, inhabitants of the island who come to the aid of Prospero and Ariel. Sprinkled in throughout the show, leading characters in and out of scenes, The Tempest also includes more music than most Shakespeare shows. Hillary Hoover, previously in Dog Park the Musical, is a featured soloist. 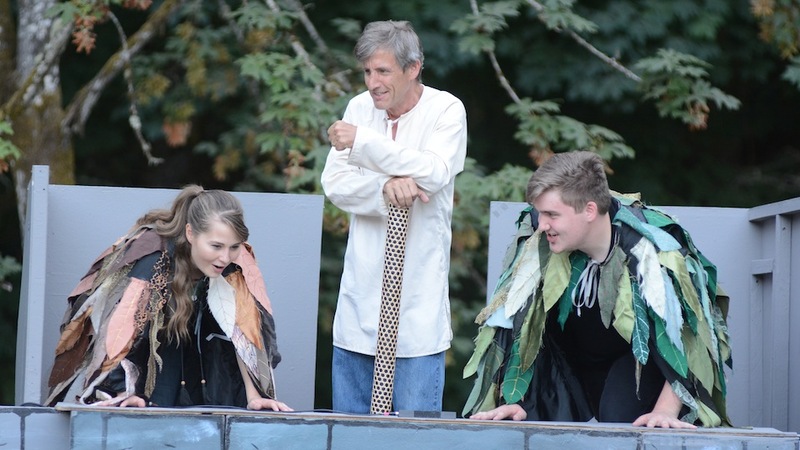 New this year, Keizer Homegrown will take its Shakespeare in the Park to Aumsville for three performances on Aug. 3, 4 and 5 at 6:30 p.m. at the Porter Boone Park Stage, 1105 Main St.